Our commitment to the land and our animals. At Sherwood Acres, we take land stewardship very seriously. Located at the headwaters of Harrods Creek in Oldham County, the practices we implement on our farm to conserve the soils and environment help protect the water quality of our farms and families that live downstream. 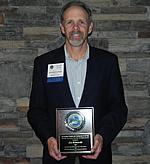 In 2011 Sherwood Acres was awarded the Oldham County Master Conservationist of the year award from the Oldham County Soil & Water Conservation District. 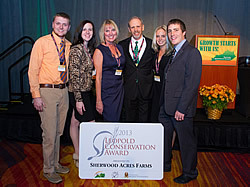 The farm was then selected in 2012 as the Master Conservationist of the Year for the entire state of Kentucky. Our continued hard work and dedication to the farm is recognized in 2013 when we received Kentucky's inaugural Leopold Conservation Award. This prestigious award is given in only 9 other states to private landowners who exemplify the spirit of this land ethic -- an individual or a family dedicated to leaving their land better than how they found it. 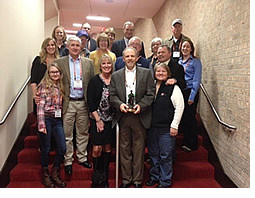 The Leopold Conservation Award recognizes extraordinary achievement in voluntary conservation with a goal to inspire other land owners through their example. See www.LeopoldConservationAward.org for more info. 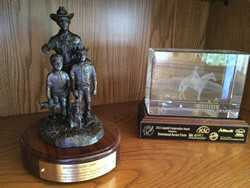 The Kentucky Cattlemen's Association nominated Sherwood Acres for the Environmental Stewardship Award from the National Cattlemen's Beef Association. This award recognizes the outstanding stewardship practices and conservation achievements of U.S. Cattle producers across the nation. Nominees compete through a strenuous application process to be one of the seven regional winners. We were notified mid 2014 that we were selected to receive the Region 1 award (17 state) at their summer convention in Denver. We spent several days filming on the farm for the award. That video can be seen at www.EnvironmentalStewardship.org. The environmental practices we implement on the farm are good for our neighbors and also important to the welfare of the cattle we raise on the farm. The humane treatment of our animals is not only the right thing to do, but our best management practices produce safe quality beef for our customers to enjoy.